The third product in the Megadungeon line, including 100 pages of amazing preprinted map. Together they make a giant map. Gaming Paper, maker of fine mapping accessories and adventures for over five years, is proud to introduce the next product in the Megadungeon line. 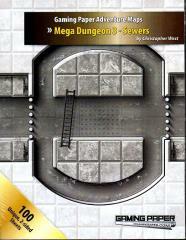 This is Megadungeon 3 "Sewers". It is 100 pages of geomorphic maps, compatible in many different configurations by design.